Yesterday, we celebrated Memorial Day here in the US, a day to honor our fallen soldiers and the sacrifices they made. 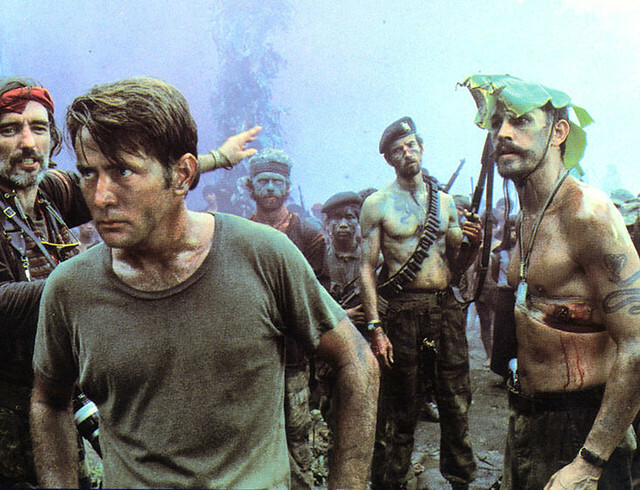 This week’s quiz is all about our servicemen & women in literature and movies. Each correct answer is worth 10 points. You have until Friday to submit your answers. Last week’s Book Sale quiz here. Leaderboard here. I’m looking for the titles only. Remember those who gave their lives for ours and for those still serving in the military around the world. Happy Memorial Day from my veterans to yours. Jason was in the Navy and my Dad was in the Army. Gage’s other Grandpa was in the Air Force. Don’t forget to give your own veterans a hug today. And then go outside and grill up some good food and have some laughs with friends and family! This past year I spent my 6th year on the New Clevelander’s Club board, having a number of positions ranging from president to newsletter editor. When I accepted the parliamentarian position last May, Gage was just along for the ride, but once he arrived in October he was running the show so we missed a lot during those next few months. In January we started going to the monthly beard meetings. He slept through that first one and we had to leave the last one early because he was disgruntled, but he liked seeing all of the smiling ladies. 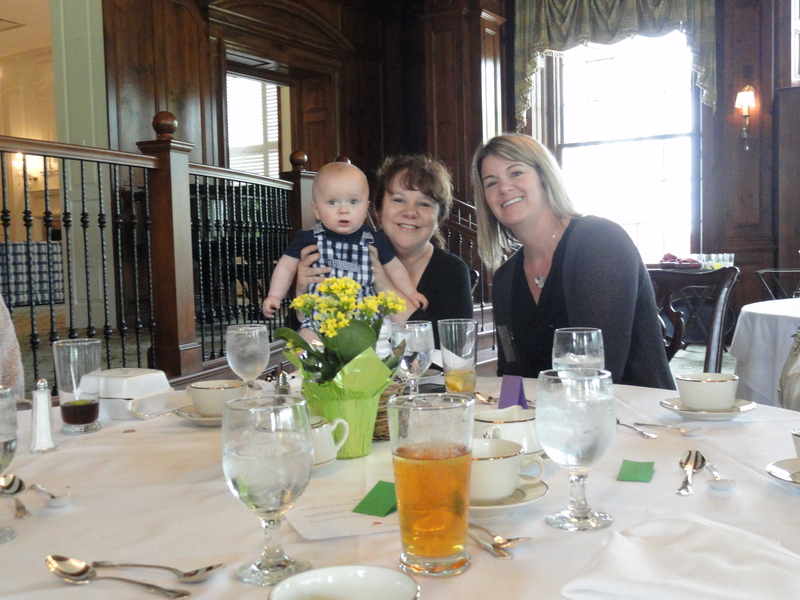 So, at the changing of the guard this week Gage got all dressed up and went to his first country club, appropriately named, The Country Club (for some reason that always makes me laugh). He left the house with socks and shoes but by the time we arrived at the club he was missing a shoe and a sock, so he went in barefoot and I appreciate the club not kicking him out since he had no shoes 🙂 That picture is us with the new president, Natalie. Needless to say we did not make it through the whole thing, but he did make it about an hour and fifteen minutes, which I thought was pretty good for him. Next time I’ll have to see if I can get him on the golf course! Every May for the past few years I’ve stacked up all of of my unread books (always the same way) and taken a picture to share with you all. 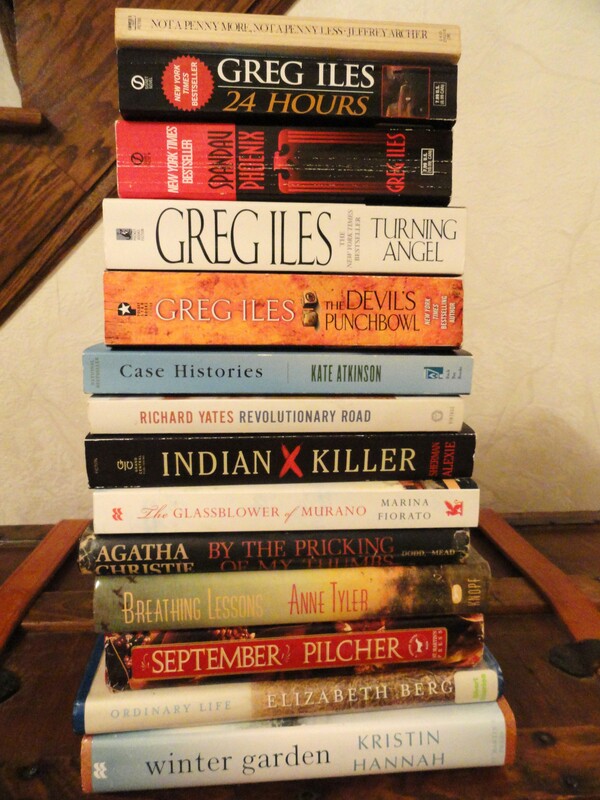 In May 2008 my stack looked like this. My post lamenting my problem in May 2009 is here. Last year’s picture is here with its 407 books plus those 5 box tops I did not count. 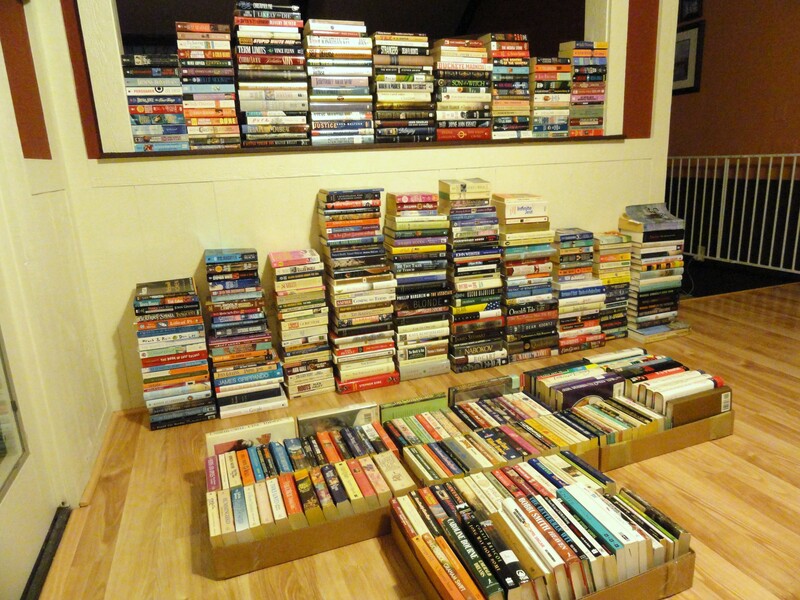 So, when I recreated the stacks this year I was happy to discover that I’d read 32. I think that’s pretty good considering how my reading time has suffered this past year. I gave away or will give away 24 more. I even took out a whole box of books from the bottom and have been giving them away this year. 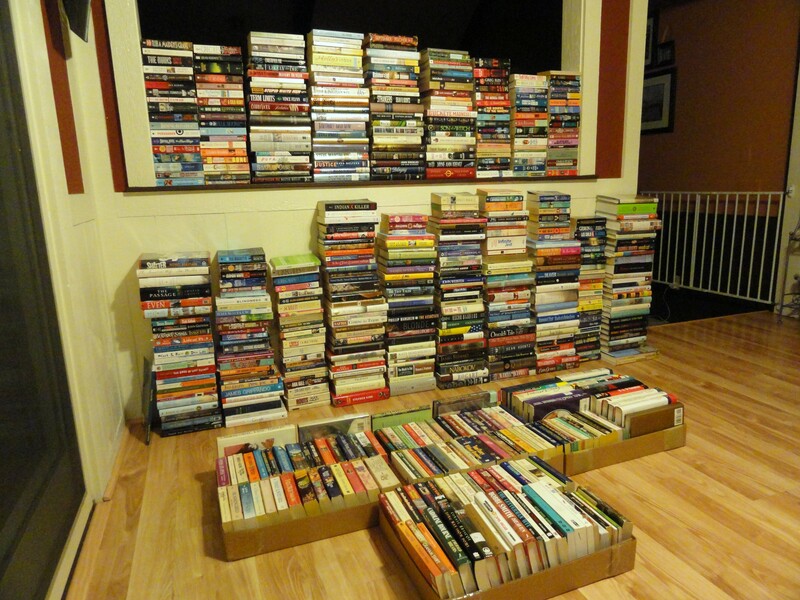 This was what it looked like with all of those books gone. So, I was feeling good. Until I added in the books I bought or received this year, which was 104. To get to this number I pulled out 15 old titles that I know I will never read and will be giving them away on June 1st, so come back for that. So, c’mon, fess up. How many books do you have sitting around waiting to be read? When I was offered the chance to read this book for the TLC book tour I jumped at the chance. I follow the news fairly voraciously (at least I did before Gage was born) and I was interested in the four stories this book covers: Martha Stewart, Scooter Libby, Barry Bonds, Bernie Madoff. I knew the most about Libby and Madoff. I am embarrassed to say that I am only halfway through the book, so I will write about the first two cases today and you can come back on Friday for the last two and my final thoughts. To lie, or not to lie, that is the question. In my humble opinion, which is also the law of the land, it is illegal to lie to the police or government officials. Stewart, a Pulitzer Prize winner, argues that these high-profile cases show how morally corrupt we’ve become. In so many instances the lying and cover-up is so much worse than the crime. Martha Stewart was and is a successful businesswoman. She was and is a woman who lied and to presecutors and got an assistant to erase an incriminating email. She was first investigated for insider trading, but they couldn’t prove that. Had she not lied she never would have gone to prison, end of story. I am not a Martha fan, don’t watch her show or read her books or magazines, but I have purchased her products and liked them very much. Only now I’d think twice. Not only is she not a very nice person, but to maintain that you are innocent against clear facts otherwise is insulting to my intelligence. The Scooter Libby case is one that I was the most familiar with and so I was surprised that of all the myriad of people involved in this story he was the one I felt the most sympathy for, maybe because he got thrown to the wolves. The case stemmed from a Novak article that gave the name of a CIA agent (Valerie Plame). This is illegal. He had two sources who in the course of the investigation outed themselves, Richard Armitage and Karl Rove. They broke the law. What happened to them? Nothing. President Bush said he would fire anyone who leaked information and even when Karl Rove admitted he was one of the leakers, President Bush kept him in the White House. I remember being disgusted by it at the time and still am. So, if these were the main culprits why did Libby get in trouble? Because he lied to investigators. Or at the very least has a very, very bad memory which is hard to believe of someone of his success. The rule breakers got away with it, but the liar did not. I have taken two main points from the first half of the book. This book is for detail oriented readers and will appeal to them best. There are lots of details and they sometimes repeat themselves a few times in a few different recollections. The second and most sad for me is that people don’t seem to be swayed by the truth. Do they like the fact that you bake a pretty cake on tv? Then you are being railroaded. Are you a Republican or Democrat? Because whatever I’m not is wrong 100% of the time. Both of these drive me crazy. You are allowed to still like a person if they broke the law, but please don’t make excuses for them. This book was sent to by the publisher for this book tour. On Saturday I made my yearly trip to the Case Western Reserve University Book Sale. I usually spend hours and hours looking over the thousands of books filling the auditorium, but I had to be quick since my father-in-law was on his way. So, I picked up the first books I saw that were on my extensive wish list. 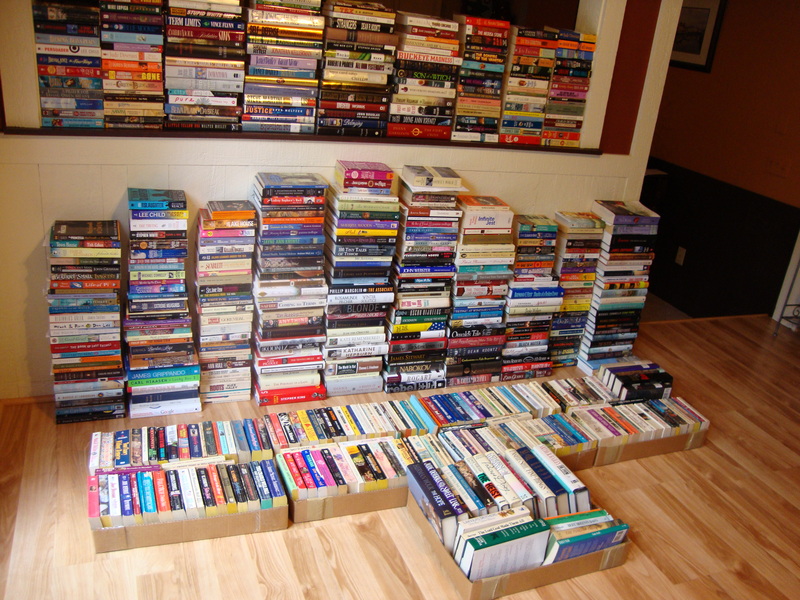 Here’s a view of the fiction section of the sale. I left as soon as my arms were full, which was at 14 books. So, here’s the quiz ad giveaway…I chose 10 first lines from 10 of these novels and all you need to do is tell me which line belongs to which book. No googling, no matter how tempting. I know this will mainly be educated guessing so to make it more fun I’m offering the person who guesses the most correct (and first) will get to choose a book from the stack for free! You have until noon Friday to submit your answers. Current Leaderboard here. Last week’s April Showers Quiz here. 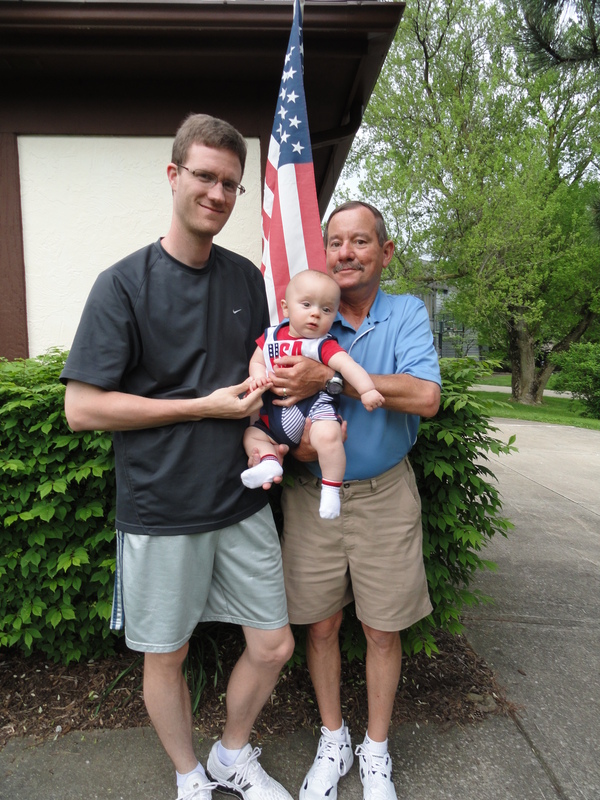 Gage’s grandpa (and new grandma) came to visit this weekend and it’s obvious he has a lot of growing to do. Daddy is 6’4″ and Daddy’s daddy is 6’5″. When I took Gage to the doctor a month ago he measured in the 7th percentile for height, which got me nervous that he may have inherited Mommy’s legs. So, I looked around for height predictors and came up with anywhere from 5’9″ to 5’11.5″, but this is based only on the height of the mother and father. 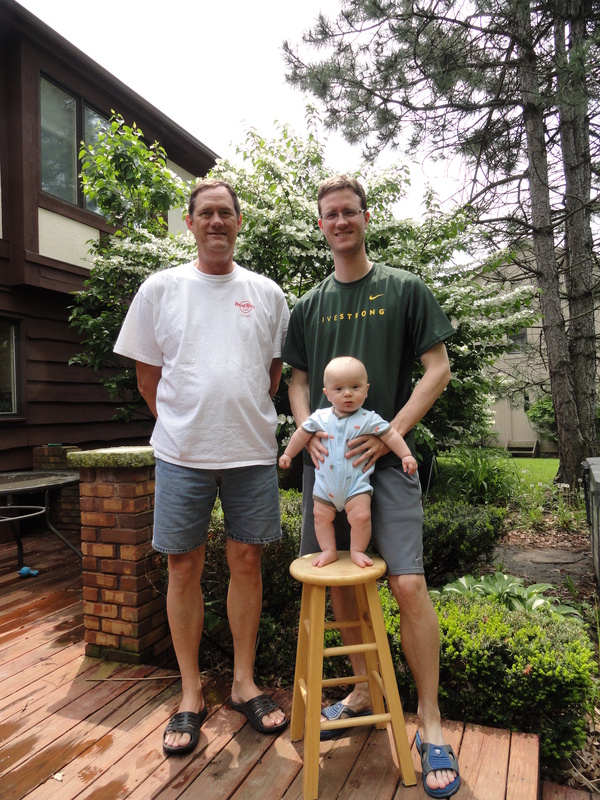 A more accurate indicator is the baby’s height at age 2. They say by the time a baby is two if you double the height that will be their adult size. We’ll have to wait for that one. So, how tall are your kids compared to you and the father/mother? Karen’s husband, David, has been killed in a fire and she thinks it was murder because of a letter he sent her just before the explosion that claimed his life. 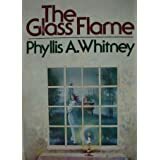 Their marriage wasn’t a good one, but she did feel an obligation to check out the situation surrounding the fires that he had gone to Tennessee to investigate. David’s half-brother, Trevor, is an architect and the victim of the fires. Trevor was also Karen’s first unrequited love. Now she is staying in his house with his wife and child and there is no end to the weirdness happening there. I thought the mystery was good. It was creepy and there were just enough people involved that you got to know them but not too many that you got confused. I liked getting to know more about architecture and photography. The book is dated, but not in a bad way. I will say that the characters didn’t really behave in a way I expected, so I didn’t really connect with them, but I still enjoyed the mystery. The only thing that seemed over the top was Karen’s love for Trevor. For some reason it annoyed me, maybe because it seemed so baseless. If you like Barbara Michaels or Victoria Holt, I think you’d like Whitney.